Our Gaga+™ baby to junior beanbag features a detachable harness that will enable your child to use the beanbag for many years to come. Both the seating area and the back of the harness feature our cuddle soft fabric which will ensure your baby’s comfort. They are also backed with a water-resistant barrier so any little accidents do not damage any of the beanbag. 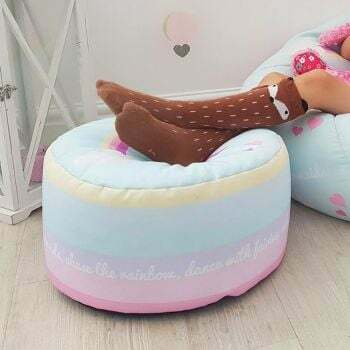 The beanbag is completed with an anti-slip and moisture resistant base. It comes filled and ready to use. The Gaga™ has an adjustable harness to ensure that your baby is sat upright in a secure and comfortable position at all times. The beans mould to your babies shape, gently supporting and preventing flat head syndrome. The gentle incline of the gaga helps with colic and acid reflux. Can’t find what you want? We design and print all our cushions in-house so why not give us a challenge? The Gaga™ baby Beanbag complies with EN12790 and BS5852 Pt1 and is suitable for babies up to 9kg. Always use on the ground and always use harness provided. NEVER leave a baby unattended in the beanbag. DO NOT pick up the product with a baby inside. The beanbag can only be used without the harness once your child is at toddler age or able to sit without any support. We would still, however, recommend your child is supervised.